Learn how to ask questions about your data using NRQL, New Relic's SQL-flavored query language, and create beautiful visualizations for analyzing your data in real-time. Write queries and create charts to display both a broad view and a highly detailed drill-down analysis of your data to understand the metrics that matter most to your team. Whether you're familiar with query language syntax or not, this course will give you the foundation you need to access a powerful array of capabilities and visualizations for analyzing your data in real-time. 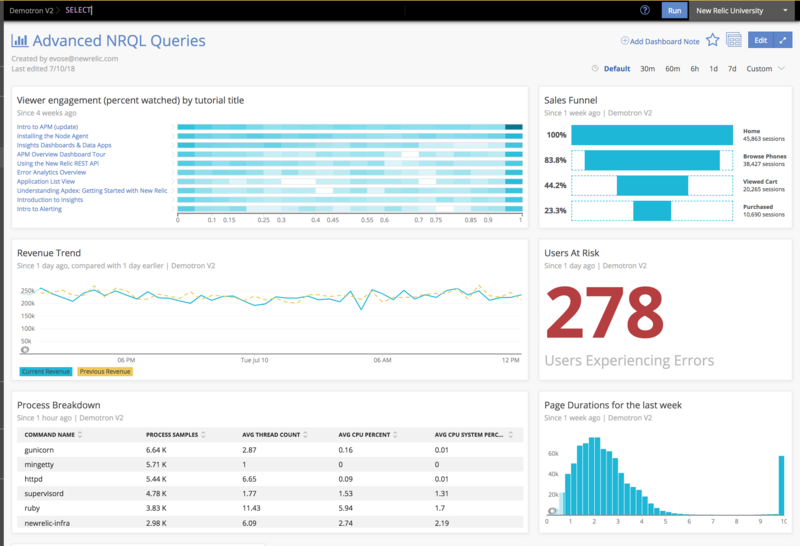 Learn how to ask questions about your data with Insights' SQL-like query language, NRQL. Break data into groups by attribute, and display results with numerical values. Narrow the scope of a large store of data by a single, specific parameter. Use FACET to separate and group your results by attribute. Display data in histogram and heat map charts. Ask questions about the completion of steps in a process, or completion of a series of selected actions. Use basic mathematical functions to analyze any numerical data. Use the Apdex function to view and compare overall Apdex scores or to test different t-values. Identify performance outliers and help set a standard of performance within your app. Help us improve; please share your feedback!